Whether we have met yet or not, know that our staff team has prayed for you and for the ways in which we can serve you! We love the people of our church, love meeting their friends and family, and love welcoming in any newcomers as family! Feel free to reach out to any of us at any time. 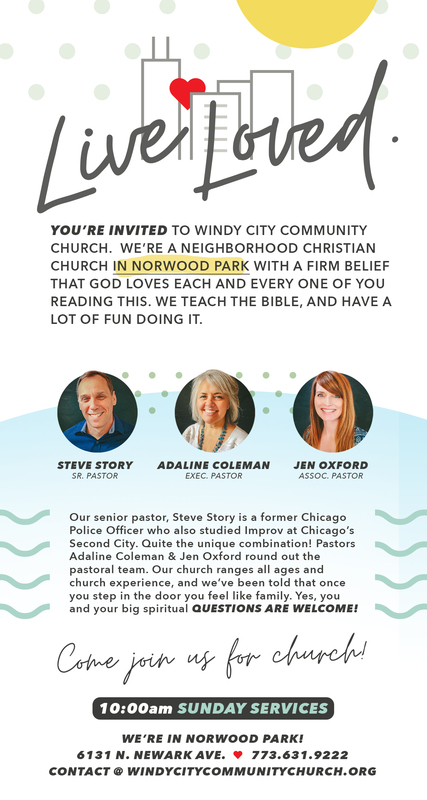 Steve is a born and raised Chicago guy and has been serving as senior pastor at Windy City since 2000. Before that, Steve was a policeman in Chicago for 14 years. Steve and his wife Kellye have 3 daughters. Steve is passionate about helping people take the next step in their spiritual journey. Pastor Adaline has been part of the Windy City team since 1993. Trinity Evangelical Divinity School was her home prior to that, having received her Master of Arts in Religion and ministering as Dean of Women and Associate Dean of Students there. Married to Rob, who is an elder here, and mom to two college age 'kids', she loves working in the background and helping people discover God and His glory and goodness through the Scriptures. Favorite Bible character? Ehud, the left handed judge. Favorite Bible verse? Psalm 27:13-14; but then Romans 10:11 is right up there, too. Jen joined the Windy City team in July 2017 after serving on the staff of Willow Creek Community Church for 9 years in the areas of Discipleship and High School ministry. She and her husband live in the suburbs (gasp!) and think the commute is totally worth it! Jen's biggest hope is that God will use her to reveal who He really is to both those who do not yet know Him and to those who want to go deeper in their faith. Reach out if you would like to meet up, share your stories or ask those questions you've been carrying around for a while. Stacey joined the Windy City worship team in 2010. Her greatest passion is Christian music. She enjoys writing and singing songs that reveal the truth about who God is. She finds perfect joy in sharing the news that God wants us to know Him and longs to be our Savior and Father. Music is an amazing tool that God can use to draw people to Himself, and magnify His Holy Name. Jaclyn joined the team in August 2018 after attending Windy City her whole life. She graduated in 2016 from Indiana Wesleyan University with a Bachelors degree in Psychology and Addictions Counseling. She is currently pursuing a Masters in Social Work from Loyola University. Jaclyn has lived in Chicago her entire life and never plans on moving! Her passion is working with children, especially those with behavior disorders. She is excited to be a part of the children's ministry. Jaclyn's other interests include hockey and dogs, especially her dog Puck shown in the picture. Email Jaclyn with any questions about Children's Church, Awana Kid's Club, or Vacation Bible School. Bill is the hero when it comes to all things concerning building cleaning and set-up! He leads a team of people who come in during various times of the week to make sure that our church is sparking clean and ready to go for the many activities, events and services that we host each week.